Sure, your run of the mill gambler on the Las Vegas strip can walk into any casino, into any sports book, and place a bet on almost any mainstream franchise or athlete in the wide world of sports. However, one must wonder, does the home team bias play any role in the process? There aren't any professional sports franchises (Outside of the AAA level Las Vegas 51's) that call the Clark County city home, but there does happen to be one prominent division one college program in town. The University of Las Vegas, Nevada has called the desert home since 1957. Sports weren't initially a priority for the school. None the less, it didn't take long for the administration to try their hand at being one of the many eye opening attractions in town. The schools basketball program, which will be the main focus of today's post, joined division one competition for the start of the 1970 academic season. Following 6 seasons of poor to mediocre play, the Runnin' Rebels found their stride in the 1977 season. That year, the club made it all the way to the Final Four. Time would tell that that certainly wouldn't be the last time America a go around with a grouping of twelve from the Sin City. Since then, the Rebels have amassed 19 NCAA Tournament appearances, made 10 Sweet Sixteens, traveled to five Elite Eights, appeared in a total of 4 Final Fours, and even captured the National Title in 1990, defeating the Duke Blue Devils. Not too shabby for a D1 program that just short of its 45th birthday. The Rebels play their home games at the Thomas & Mack Center, which they have called home since 1983. In addition to Rebels games, the 18,000-plus seat facility has hosted events such as the NBA All-Star Game in 2007, multiple guest speaking appearances, and a plethora of concerts. In it's time, the building has also seen plenty of stars pass through it's doors wearing the Scarlet and Gray. Some of the more notable Rebels over the years that have had theirs jersey retired by the university are Larry Johnson, Reggie Theus, Greg Anthony, and Armen Gilliam. There are also multiple players who have played or currently play in the NBA, who have also run a fast break of two in the desert; some being: Joel Anthony, Louis Amundson, Marcus Banks, Shawn Marion, and even Isaiah "J.R." Rider. The cap shown above was sent to me by a friend and avid reader of TFD, Angel Del Rosario, who you may remember from previous posts. Angel was recently featured by New Era in a Collectors feature video, which we shared a couple days ago on the blog. Angel was kind enough to pick this up from the UNLV bookstore, and send it my way a few months back. Props to him for that. It was much appreciated. The cap features a Scarlet and black crown, with a black brim. 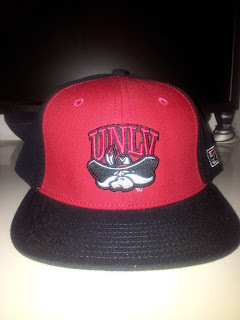 On the front, the UNLV Rebel caricature is centered in all his glory. On the reverse, the name "Rebels" is simply spelled out in Scarlet, over a black backdrop. Overall, an incredibly classic cap not to be overlooked. Hope you all enjoy your Sunday, and distract yourself briefly from the unavoidable realization of yet another Monday being just around the corner.